Title: "We Want To Outdo Ourselves And People's Expectations"
Thirteen albums in and Manic Street Preachers frontman James Dean Bradfield is older, wiser and a little bit creakier, but the passion still burns. 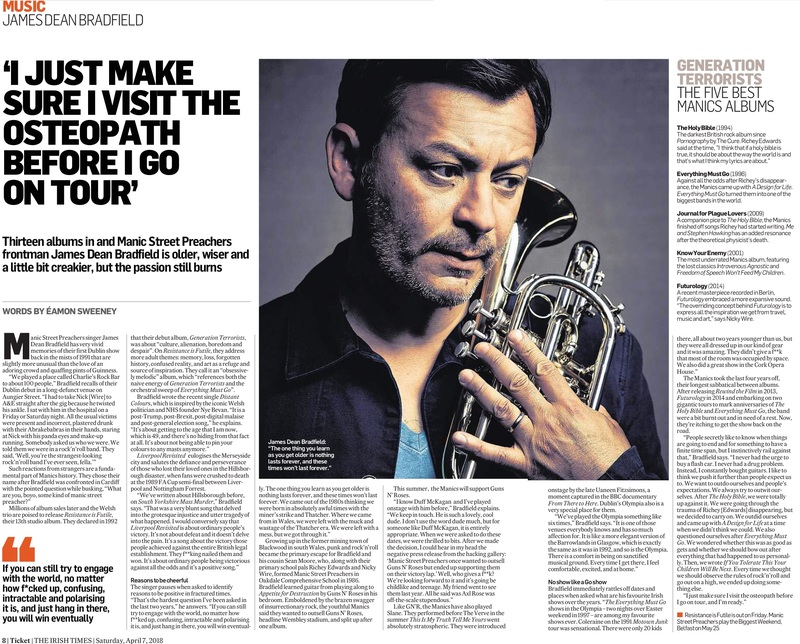 Manic Street Preachers singer James Dean Bradfield has very vivid memories of their first Dublin show back in the mists of 1991 that are slightly more unusual than the love of an adoring crowd and quaffing pints of Guinness. Millions of album sales later and the Welsh trio are poised to release Resistance is Futile, their 13th studio album. They declared in 1992 that their debut album, Generation Terrorists, was about “culture, alienation, boredom and despair”. On Resistance is Futile, they address more adult themes: memory, loss, forgotten history, confused reality, and art as a refuge and source of inspiration. They call it an “obsessively melodic” album, which “references both the naive energy of Generation Terrorists and the orchestral sweep of Everything Must Go”. Liverpool Revisited eulogises the Merseyside city and salutes the defiance and perseverance of those who lost their loved ones in the Hillsborough disaster, when fans were crushed to death at the 1989 FA Cup semi-final between Liverpool and Nottingham Forrest. Growing up in the former mining town of Blackwood in south Wales, punk and rock’n’roll became the primary escape for Bradfield and his cousin Sean Moore, who, along with their primary school pals Richey Edwards and Nicky Wire, formed Manic Street Preachers in Oakdale Comprehensive School in 1986. Bradfield learned guitar from playing along to Appetite for Destruction by Guns N’ Roses in his bedroom. Emboldened by the brazen swagger of insurrectionary rock, the youthful Manics said they wanted to outsell Guns N’ Roses, headline Wembley stadium, and split up after one album. This summer, the Manics will support Guns N’ Roses. Like GN’R, the Manics have also played Slane. They performed before The Verve in the summer This Is My Truth Tell Me Yours went absolutely stratospheric. They were introduced onstage by the late Uaneen Fitzsimons, a moment captured in the BBC documentary From There to Here. Dublin’s Olympia also is a very special place for them. The Manics took the last four years off, their longest sabbatical between albums. After releasing Rewind the Film in 2013, Futurology in 2014 and embarking on two gigantic tours to mark anniversaries of The Holy Bible and Everything Must Go, the band were a bit burnt out and in need of a rest. Now, they’re itching to get the show back on the road. “People secretly like to know when things are going to end and for something to have a finite time span, but I instinctively rail against that,” Bradfield says. “I never had the urge to buy a flash car. I never had a drug problem. Instead, I constantly bought guitars. I like to think we push it further than people expect us to. We want to outdo ourselves and people’s expectations. We always try to outwit ourselves. After The Holy Bible, we were totally up against it. We were going through the trauma of Richey [Edwards] disappearing, but we decided to carry on. We outdid ourselves and came up with A Design for Life at a time when we didn’t think we could. We also questioned ourselves after Everything Must Go. We wondered whether this was as good as gets and whether we should bow out after everything that had happened to us personally. Then, we wrote If You Tolerate This Your Children Will Be Next. Every time we thought we should observe the rules of rock’n’roll and go out on a high, we ended up doing something else. This page was last modified on 7 April 2018, at 03:55.